Today we started our travels home by flying to La Paz. We were met in the airport by the Lajastambo team to say our last goodbyes. Though we only had six days with the team, the goodbyes were still so hard. The Lajastambo team was incredibly friendly and hospitable, providing us with an indescribable experience. At the airport they gave us the welcome banner, which had now been signed by the FH staff. It was a bittersweet goodbye. After landing in La Paz, we made our way to the hotel, stopping on the way to admire the incredible view of La Paz and the mountains. After arriving at the hotel and eating lunch we had a chance to check out the tourist market area and buy gifts for friends and family back home. 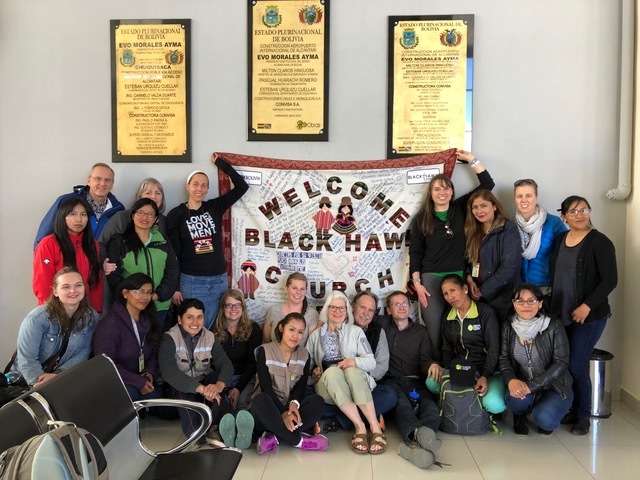 Though we have had an incredible time here in Bolivia (and would rather not come home to April snow), we all look forward to reuniting with friends and family at home. We are all very excited to share more pictures and experiences with loved ones. This entry was posted in 2018 by blackhawkgoteams. Bookmark the permalink.